Entertainer, Saxophonist and Jazz singer, Composer of “Sax Life” the jazz musical theatre show. The ultimate entertainer, Serge shares his passion for Jazz with his audiences wherever his shows take him. 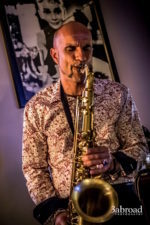 Jazz historian, comedian, singer, and multi-instrumentalist, Serge performs on all saxophones. He has been gracing the planks of various stages throughout Australia as well as France, Germany, Belgium, Japan and Switzerland, to name but a few. His latest creation “Sax Life” is a Jazz musical theatre that has been touring WA for over a year now and is set to go over East in the next few months. Serge will also be touring Europe in 2019.